The Catalogue of Life is the most comprehensive and authoritative global index of species currently available. It consists of a single integrated species checklist and taxonomic hierarchy. The Catalogue holds essential information on the names, relationships and distributions of over 1.5 million species. This figure continues to rise as information is compiled from diverse sources around the world. the Catalogue of Life Annual Checklist. 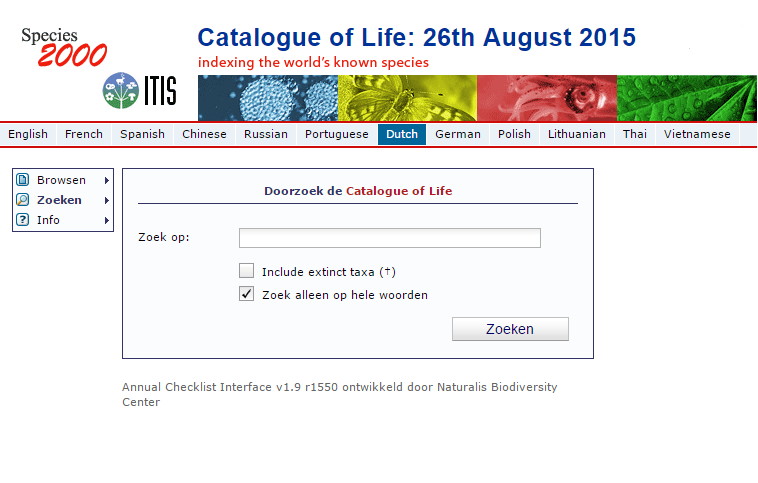 The Catalogue of Life is led by Species 2000, working in partnership with the Integrated Taxonomic Information System (ITIS). The Catalogue of Life depends upon the contributions of more than 100 Global Species Databases, established at centers of expertise around the world. New data sources are continuously being identified to address gaps in the Catalogue. An overview of all contributing databases can be found here. There are JSON/XML/PHP-based Web Services available for scientists and software developers to query programmatically the latest edition of the Catalogue and the Annual Checklists. An overview can be found here.